Shu-Yin's Sanctuary: Shern Having His Eyes Checked Again! Shern Having His Eyes Checked Again! Shern complained to me a few days ago that his left eye vision was 'blur blur'. I was rather taken aback as Shern accidentally scratched his left eyelid about a week ago. 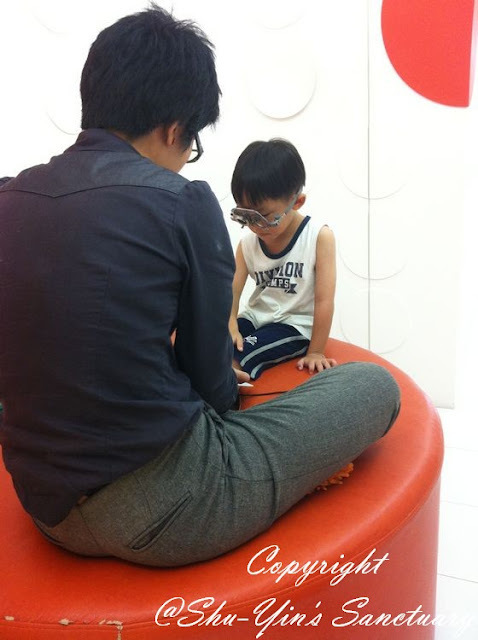 I quickly made an appointment with Miss Ho from Eyecon Optometry again just like Shern's last eye check visit in May. I didn't want to delay in having it checked when it comes to something so important such as my son's eye. I told Miss Ho about Shern's remarks and also told her about his recently healed scratched left eyelid. She said it seems unlikely that the blurred vision is caused by the scratched eyelid on his cornea, but she will still check it nonetheless. Miss Ho checked his long vision eye by eye, and also his short vision. She also checked his corneas for scratches. All seems normal. Shern could identify the shapes. Phew. Thankfully all went well, because it would be difficult for such an active 4yo to wear specs! Miss Ho advised that we'll just monitor it and see if Shern still complains about his 'blur left eye'. And then we will see from there. This time the consultation fee was RM30. Very worth it because it gave me peace of mind that Shern's eye is ok.